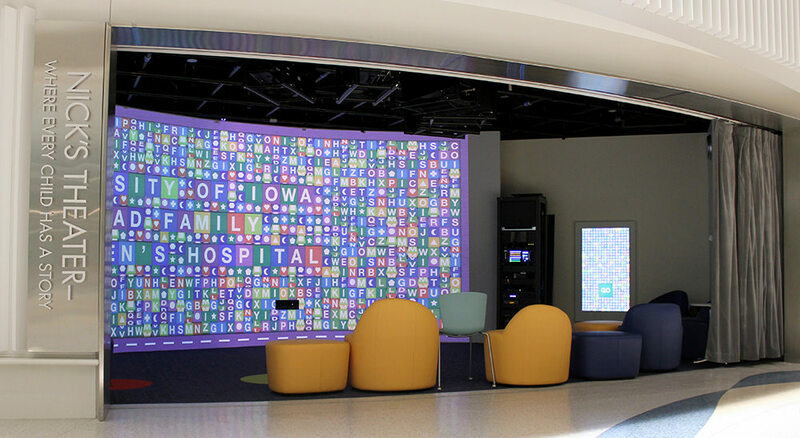 Perfect Prototype developed games using Microsoft Kinect technology for University of Iowa Stead Family Children’s Hospital’s new interactive theater. Users use a touchscreen monitor kiosk to easily select between four games to play on the larger interactive wall. Once a specific game has been selected, up to 4 players are allowed to simultaneously play. 5 projectors blended over a 30+ ft. wall created a seamless immersive environment. Soar through American landmarks as an eagle. Up to 4 players are able to control an eagle using upper body movement steering them right, left, up and down. Users try to steer their bird to fly through floating rings to collect objects. Users can play to collect as many objects as possible, or just enjoy the feeling of soaring through America. Enjoy an interactive story-telling experience bring “constellations” to life. This game selects between three different stories randomly, each with four randomly chosen a voice-overs. Users discover and activate “hot-spots” throughout the story – such as launching fireworks, discovering treasures, launching airplans and UFOs. Perfect Prototype teamed up with long time partner Dimensional Innovations to realize this installation.